The MP-401SPF and SP 4520DN monochrome systems come with a compact footprint and a 4.3-inch touchscreen. Its print speed is 40 pages per minute, the maximum print resolution is 1200 by 1200 dpi. The first printout is 5.2 for the MFP and 5 seconds for the printer. Ricoh has complemented its product range with the MP 401SPF multifunction device and the SP 4520DN printer. The two black and white systems are characterized by the manufacturer, especially by their compact footprint and low energy consumption. Both models are available now at the recommended retail price of 2490 (MP 401SPF) respectively 1450 Euro (SP 4520DN) from specialist retailers. The MFP measures 41.9 by 42.7 by 48.4 inches and weighs around 23 kilograms. The printer comes to 37 times 39.2 by 42.7 inches and a weight of 15.5 kilograms. The newcomers are powered by a 533 MHz fast processor, each with a maximum of 1 GB of RAM at its disposal. In both can also optionally install a hard drive, which may be at the MP 401SPF a maximum of 250 GB and the SP 4520DN at most 320 GB. As with MFPs, interfaces include a Gigabit Ethernet port and a USB 2.0 port as standard. Both can also be optionally upgraded with a WLAN module according to the IEEE 802.11n standard and a parallel interface according to the IEEE 1284 standard. 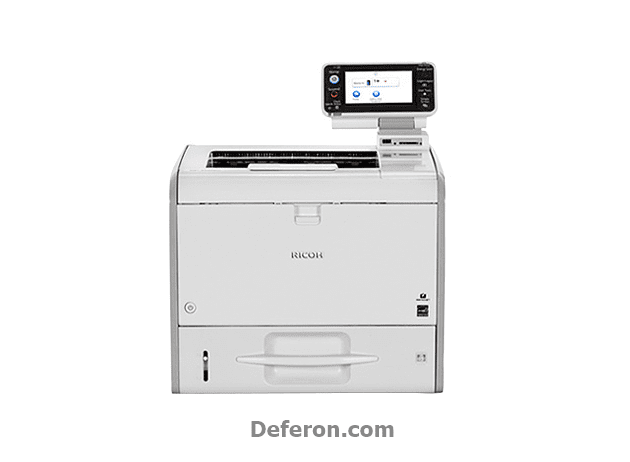 In addition, both the MFP and the printer are equipped with a 4.3-inch color touch display. In addition, as with the SP 4520DN, the MP 401SPF has configurable speed-dial buttons on board. The new releases also allow direct printing via USB sticks or SD cards. A detour via the PC is not required. In addition, both models support the Ricoh Mobile Print App and allow documents to be viewed or printed directly from the cloud. In addition to being able to copy, scan and fax the MFP in addition to printing, there are other differences between the two Ricoh products. While the black-and-white MFP needs a warm-up time of only 14 seconds, the black and white printer is ready after 17 seconds. In the latter case, the first print is in the output tray after 5 seconds, after 5.2 seconds in the MFP. The printer model SP 4520DN is designed for a maximum monthly print volume of 10,000 prints, the MP 401SPF comes to only 3000. The latter integrates an automatic duplex document feeder (ARDF), which can be fed up to 50 sheets at the same time. According to the supplier, the copper component of the MP 401SPF needs a maximum of 6 seconds to output the first copy, and its resolution is then a maximum of 600 by 600 dpi. In addition, reductions of up to 25 percent and increases of up to 400 percent are possible. The resolution of scanned documents is between 100 and 600 dpi, faxes resolve at a maximum of 200 by 200 dpi. The maximum power consumption of the MP 401SPF is given by the manufacturer at around 1180 watts, while the power consumption of the SP 4520DN is 573.2 watts. The devices have a print resolution of up to 1200 x 1200 dpi and a maximum print speed of 40 pages per minute in common. A maximum of 250 sheets of paper fit into each output bin and both support standard automatic duplex printing. The SP 4520DN is an innovative, compact solution ideal for small to mid-sized workgroups. It simplifies your workflow and delivers increased productivity with outstanding performance, speed, and a 4.3-inch touch panel. It also offers world-class environmental values and high-cost efficiency. Thanks to its small footprint, this printer can be easily placed on a desk. Despite its compact size, however, it offers uncompromising quality. It prints with a resolution of 1,200 x 1,200 dpi and a speed of 40 pages per minute, and its easy-to-use, symbol-based 4.3-inch color touch panel allows you to personalize your home screen and add shortcuts to it. This allows you to optimize your system for the most common tasks.